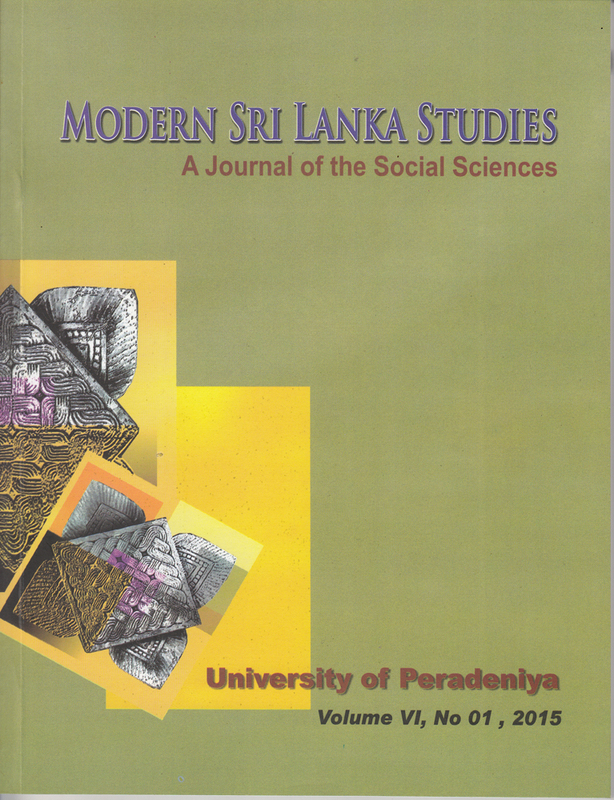 Modern Sri Lanka Studies (MSLS) is a Journal of Social Sciences; published bi-annually by the Faculty of Arts, University of Peradeniya, Sri Lanka. Its main objective is to disseminate both theoretical and applied research articles, review articles and book reviews on the Social Sciences among a wider academic community. Researchers attached to universities and research institutes in Sri Lanka and overseas are encouraged to use MSLS as an outlet for their research work. Articles relating to the Humanities will also be considered for publication in MSLS provided that they are able to demonstrate their relevance and link to the Social Sciences. MSLS shall evaluate the general significance of research considering theoretical and practical applications where relevant in the selection of articles for publication. The journal is published in both printed and online versions. With the aim of providing the widest possible readership for the intellectual, the online version of MSLS is freely accessible to anyone. We welcome original research articles for the Volume VIII , 2017. Click here to download Call for Papers Notice. > Click here to download Call for Papers Notice. Modern Sri Lanka Studies is a journal of contemporary work in the fields of Social Sciences. It’s main objective is to publish both theoretical and applied research articles, review articles and book reviews related to Social Sciences and disseminate such knowledge among a wider community. It also encourages researchers attached to universities and research institutes in Sri Lanka and abroad to use Modern Sri Lanka Studies as an outlet for their research work. Articles relating to Humanities will also be considered for publication in Modern Sri Lanka Studies provided that they have shown their relevance and applicability to the Social Sciences. Modern Sri Lanka Studies shall evaluate the general significance of research considering theoretical and practical applications where it is relevant in the selection of articles for publication. Articles submitted to the journal should not have been published before in their current or substantially similar form, or be under consideration for publication with another journal. Authors must obtain permission to reproduce a part of a paper, book and all matter such as maps, diagrams, figures and photographs if they are not their own original productions. Such letters of permission should be submitted to the Co-editors before publication. The copyright of articles, review articles and book reviews published in Modern Sri Lanka Studies is reserved for the Modern Sri Lanka Studies. Authors shall obtain the permission, in advance, from the Co-editors to reprint/reproduce whole or a part of the paper published in Modern Sri Lanka Studies. Each paper is reviewed initially by one of the co-editors for the suitability of publication in Modern Sri Lanka Studies. If it is judged suitable for publication, it is then sent to two reviewers for double blind peer review. Based on the recommendations of the reviewers, the Editorial Board of the journal decides whether the paper should be accepted as is, revised or rejected. The Editorial Board has also reserved the right to copy editing the papers accepted for publication. Articles are accepted for consideration on the understanding that they are not being submitted elsewhere. Three copies of the article/paper should be sent to the Co-editors, Modern Sri Lanka Studies, Faculty of Arts, University of Peradeniya, Peradeniya 20400, Sri Lanka. Instead, a softcopy of the paper (MS Word/PDF file) could be email to editormsls@gmail.com. Authors should provide the following information in a separate sheet. Title of the article/ review paper/book review (not more than 10 words) and a brief autobiographical note of each author including full name, affiliations, address for all correspondence, telephone and fax numbers, e-mail addresses, and acknowledgement (if any). In the case of multiple authors, one author should be identified as the corresponding author. The article/paper, which will be sent to reviewers, should include the following: Title of paper (not more than 10 words), Abstract of up to 100 words, Keywords up to 5-6 words, text of the article/paper, and complete list of references. As a guide, articles should not normally be less than 4000 words not more than 8000 words inclusive of footnotes but excluding references. Review articles and book reviews should be not more than 3000 words. The author(s) should not be identified anywhere in the article. Authors may use the following structures in preparation of their papers with a view to publication in the Modern Sri Lanka Studies. However, papers with alternative structures are also accepted. Research articles may include the following sections: Introduction: This section will explain the background of the study, research questions, research gaps, research hypothesis if any, research objectives/aims, significance of the study and arrangement of the paper; Literature Review: This section should describe relevant theoretical and empirical literature related to issue in concern. It is always advisable to review most relevant and updated part of literature extensively in the paper; Methodology: This section describes data and analytical techniques used in the paper extensively; Analysis / Discussion: This section presents results and evidence, analyzes results and evidence and makes deductions based on results and analysis; Conclusions: This section presents a summary of results and analysis, makes conclusions based on results and analysis and draw policy implications; References: List all references cited in the text is included in this section. The main purpose of a review article is to examine the current state of the relevant publications on a given topic to initiate a discussion about research methodologies and the findings related to the topic in concern. Review articles may include the following sections: Introduction and Background; The Body of the Paper; Conclusions and Future Direction, and Literature Cited. Book reviews may include the following sections: Introduction (what the review will say); Background Information (places the book in context and discus criteria for judging the book); Summary (main points of the book); Evaluation (evaluate arguments in the book); Conclusions; and References. Articles/papers should be submitted in double-spaced, one-side typescript, printed on good quality A4 paper. Microsoft Word is the preferred word processor. In the paper, font should be Times New Roman,12 size (bold and italic type can be used as necessary); The text should be ranged left and unjustified; Margins (top and bottom 1" and left and right 1.25"); Headings and paragraphs should be separated by two carriage returns; There should be only one space between words and only one space after any punctuation; Use standard international units of measurement wherever it applies; Numbers: adopt a rule that all numbers under 10 should be spelt out in letters. All numbers of 10 or more should be rendered in digits. If a number is used at the beginning of a sentence, it should be spelt-out in letters; Figures (charts, diagrams, drawings and photographic images) and Tables should be clear in quality, in black and white, numbered consecutively with Arabic numerals, and provided with the source; Abbreviations: The details of the abbreviation should be given when it appears first; Headings and subheadings: In dividing articles under headings, use all uppercase, initial uppercase and italic, respectively for main headings, and sub headings under a main heading; Notes: should be kept minimum and placed at the end of the text as Endnotes; References: must be in Harvard style and carefully checked for completeness, accuracy and consistency. References should be indicated by giving the author's name and the year of publication (with page references where necessary) as given below: Summarize a book/article: Phillips (1999) suggests that … ; Direct quote from a book or a journal article: with one author, Adair (1988: 51) states that ‘the centrepiece …’ or ‘the centrepiece …’ (Adair, 1988: 51); with two authors, Harrow and Hatcher (1996: 69-70) insist that ‘structure must be … ’or ‘structure must be … ’ (Harrow and Hatcher, 1996: 69-70); use this method up to three authors and if more than three authors use, Morris et al. (2000: 47) state that ‘the debate of … ’ or ‘The debate of …’ (Morris et al., 2000:47). Quoting another author(s): when quoting from another author to support an argument, use Eisenberg and Smith (in Bolton, 1986: 85) agree that ‘it is hard …’, here Bolton in his 1986 publication has quoted Eisenberg’s and Smith’s research to prove a point. Paraphaze: By improving your posture you can improve how you communicate feelings of power and confidence (McCarthy and Hatcher, 1996: 111). Anonymous authors: replace the author’s surname with the title of the work in the brackets containing the reference, e.g. The flora and fauna of Britain ‘has been transported …’ (Plants and Animals of Britain, 1942: 8). Newspaper and Magazine articles: Reference newspaper and magazine articles in the same way you would for other books and journals. If the author is anonymous, use the following method, The Guardian reported that twenty-nine inmates were participating in the programme (‘Serving time’, 1996: 21). Separate two references in a similar theme: use the semicolon to separate the two (Turabian, 1996: 56; Petelin and Durham, 1992:169). Many references from an author in the same year of publication: if use two or more references of the same author published in the same year, place a lower-case letter after the publication date, with ‘a’ for the first reference, and ‘b’ for the second, and so on, e.g. (Adam, 1978a:55, Adam, 1978b:10). Referencing from electronic sources: electronic sources, such as WWW pages, electronic databases and electronic journals, are cited in the text in much the same way as traditional print sources, with the exception of page numbers. If no publication date is available, and this might be the case for WWW pages, then where the date should go, insert (n.d.) which stands for ‘no date’. If no author is listed for an electronic source, use the title of the publication in the same way as you would for any other anonymous source. For books: Surname, initials (year), title of book, place of publication, publisher. e.g. Adair, J. (1988), Effective time management: How to save time and spend it wisely, London, Pan Books. For book chapters: Surname, initials (year), “chapter title”, in editor’s surname, initials (Ed. ), title of book, place of publication: publisher, pages. e.g. Calabrese, F.A. (2005), “The early pathways: theory to practice”, in Stankosky, M. (Ed. ), Creating the discipline of knowledge management, Now York, Elsevier, pp.15-20. For journals: surname, initials (year), “title of article”, journal name, volume and number, pages. e.g. Gomes, O. (2010), “Consumer confidence, endogenous growth and endogenous cycles” Journal of Economic Studies, Vol. 37 No 4, pp 377-404. For working papers: surname, initials (year), “title of article”, working paper [number if available], institution or organization, place of organization, date. e.g. Moizer, P. (2003), “How published academic research can inform policy decisions: the case of mandatory rotation of audit appointments”, Working Paper, Leeds University Business School, University of Leeds, Leeds, 28 March. For published conference proceedings: surname, initials (year of publication), “title of paper”, in surname, initials (Ed. ), Title of published proceedings which may include place and date(s) held, place of publication, publisher, pages. e.g. Jakkilink, R. (2007), “Information and Communication Technologies in Tourism” 2007 proceedings of International Conference in Ljubljana, Sloveniya 2007, Vienna, Springer-Verlag, pp. 12-32. For unpublished conference proceedings: surname, initials (year), “title of paper” paper presented at name of conference, place of conference, date of conference, available at: URL if freely available on the internet (accessed date). e.g. Aumueller, D. (2005), “Semantic authoring and retrieval with wiki”, a paper presented at the European Semantic Web Conference, Heraklion Crete, 29 May-1 June, available at : http://dbs.unileipzig.de/file/aumueller05wiksar.pdf (accessed 20 February 2007). For encyclopaedia entries with no author or editor: title of encyclopaedia (year), “title of entry” , volume, edition, title of encyclopaedia, publisher, place of publication, pages. e.g. Encyclopaedia Britannica (1926), “Psychology of culture contact”, Vol 1, 13th ed., London and New York, Encyclopaedia Britannica, pp. 765-771. [for authored entries, please refer to book chapter guidelines above]. For newspaper articles (authored): surname, initials (year), “article title”, newspaper, date, page. e.g. Smith, A. (2008), “Money for old rope”, Daily News, 21 January, pp.1, 3-4. For news paper articles (un-authored): newspaper (year), “article title”, date, page. e.g. Daily News (2010), “Small change”, 20 April, p. 2. For electronic sources: if available online the full URL should be supplied at the end of the reference, as well as the date when the resource was accessed. e.g. Castle, B. (2005), “Introduction to web services for remote portlets”, available at: www.128.ibm.com/developerworks/library/ws-wsrp (accessed 12 November 2007). Once accepted for publication, the Co-editors may request the final version in both MS Word and PDF formats as attachments to an e-mail or to be supplied on a CD-ROM. Final submission guidelines will be provided when an article/a review article/a book review is accepted for publication. The manuscript will be considered to be the definitive version of the article. The corresponding author must ensure that it is complete, grammatically correct and free from spelling or typographical errors. Click here to download Call for Papers Notice.